Hello Volunteers! Thank you for your involvement in our community. We could not do this important work without you. Please look at the volunteer opportunities below and let us know which you are interested in. Reach out to learn which shifts are open. Contact: Steve Sondheimer at ssondheimer@centeronhalsted.org using the subject line "First Floor Receptionist". AVP Grass Roots Organizer Volunteers will be an essential part of the "AVP in Unexpected Places" visibility campaign. Volunteers will be given guidance and trained to develop a short 5-10 minute talk about the importance of AVP and the services provided. Volunteers will be empowered to work in pairs to identify organizations, meetings, places, events, etc. where they will go and give the speech about AVP on behalf of COH. Contact: Steve Sondheimer at ssondheimer@centeronhalsted.org using the subject line "AVP Grassroots Organizer". Do you enjoy making people feel welcome? Help us check people in for this training, collect surveys at the end, and distribute CEU certificates. You are welcome to stay for the training itself or take a break between 10:45am and 12pm. Contact: Steve Sondheimer at ssondheimer@centeronhalsted.org using the subject line "LGBTQ Clinical Work Training". Youth Behavioral health services are provided without cost to the youth. This position will support the youth services department by providing individual and group psychotherapy, and by helping with de-escalation or crisis interventions as needed. The approach can be informal and interventions tend to be less structured that the customary one-hour session. Provide individual and group psychotherapy as well as conducting needs assessments in accordance with COH established policies, procedures, and practices. Contact: Ing Swenson at iswenson@centeronhalsted.org using the subject line "Volunteer Youth Behavioral Health Therapist". Contact: Hector Torres at htorres@centeronhalsted.org using the subject line "Volunteer Behavioral Health Therapist". Do you enjoy making people feel welcome? Help us collect demographic information, check guests in, collect payment, and assist with event logistics. Contact: Steve Sondheimer at ssondheimer@centeronhalsted.org using the subject line "LGBTQ Family Picnic". Contact: Steve Sondheimer at ssondheimer@centeronhalsted.org using the subject line "Trans Ice Cream Social". Do you have an eye for impeccable lighting or ear for great sound? If so, we would love to put you to work as a lights and/or sound volunteer for an upcoming event in our theater space. We are regularly looking for volunteers to assist inside our tech booth and would love to contact you when there is a need. Previous experience working in technical theater, lights, or sound is highly preferred. Contact: Steve Sondheimer at ssondheimer@centeronhalsted.org using the subject line "Tech Booth". Center on Halsted periodically needs ASL translators to help make our events and programming accessible. If you are proficient with ASL and interested in putting your skills to use, then we probably have an upcoming opportunity for you. Opportunities could include but are not limited to community and cultural events, youth programming, senior services, or special events. Contact: Steve Sondheimer at ssondheimer@centeronhalsted.org using the subject line "ASL". The GED program immediately needs tutors on Tuesdays and Thursdays. The content areas are basic math, language arts, science and social studies. The tutors do NOT need to be experts but do need to be compassionate and regular. Contact: GED Administrator at GED@centeronhalsted.org using the subject line "GED Tutor". The Cyber Center is one of the most used resources offered by the Center on Halsted. Many of our patrons access the Cyber Center for job hunting, resume building, social media and other technology-based opportunities. Additionally, the Cyber Center sets aside special hours for specific populations, including our trans community, our senior population, youth patrons and the general public. Center on Halsted is seeking a core group of volunteers that can make weekly commitments of at least 2 – 3 hours. With the recent decision by the newly appointed FCC Chairman to stop certain companies from providing discounted high-speed internet to low income consumers, our FREE Cyber Center stands to become an even more important as a community resource. Perhaps you are interested in helping the Cyber Center but cannot make a standing commitment. If so, you might join our team of ‘on call’ Cyber Center volunteers—that is volunteers who can come in spontaneously as needed. Contact: Steve Sondheimer at ssondheimer@centeronhalsted.org using subject line "Cyber Center". Do you enjoy speaking with new people? Want to encourage stakeholders to make a difference in the lives of LGBTQ Chicagoans who rely on the Center’s services? If you answered yes to both of these questions then you would make a great phone-a-thon volunteer! You will be instrumental in calling past donors and giving them the opportunity to invest in the Center’s work. Other calls include, thanking current donors and inviting people to join us for events during the Holiday Season. You can come in during the week at a time that works for you, for as many hours as you’d like. We are flexible to your schedule. Contact: Steve Sondheimer at ssondheimer@centeronhalsted.org using subject line “Phone-a-thon Volunteer”. I hope you’re all doing well. This month we are still seeking more volunteers to help out on the 2nd and 4th Fridays at the Walgreens – Logan Square location. Again, if you are unavailable for a complete shift, please email me back which specific hours work best for you and I can put you on the calendar. As always, please email me back with specific dates/times you would like to volunteer on and I’ll add you to the calendar! Thanks everyone! Quick Note: If you or someone you know has ever injected drugs recreationally, please be aware we are now offering free, rapid HCV testing here at Center on Halsted! Note: this is not the only way to contract Viral Hepatitis, but certainly a common mode of transmission. Contact: Javier Arellano at jarellano@centeronhalsted.org. 3:00–7:00 p.m. Walgreens Pharmacy - State St. 151 N. State St. 1-2 3–7 p.m.
1 (Spanish speaker) 9 a.m.–1 p.m.
4:00–7:00 p.m. Walgreens Pharmacy - Lakeview 2817 N. Clark St. 1-2 4–7 p.m.
3:00–7:00 p.m. Walgreens Pharmacy - 79th St.
10:00 a.m.–4:00 p.m. Cannabis Health & Wellness Fair 7415 S. East End Ave. 0 10 a.m.–4 p.m.
Are you a volunteer who is good at getting your hands dirty and performing group service projects? Or perhaps you are one of those amazing humans who simply love to clean. The newly formed Deep Clean Team is calling your name! Every now and again special deep clean projects arise and when they do, perhaps we can call you. Contact: Steve Sondheimer at ssondheimer@centeronhalsted.org using the subject line "Deep Clean". Do you enjoy caring for plants? Spring is around the corner and we’re looking to recruit some dedicated volunteers to take on a weekly shift. As a member of the Green Team, you would water plants on days when there is no rain. Once you select your shift (day) of the week, you can choose to come in in the morning, afternoon, or evening to water the plants. Watering takes place on the 3rd floor deck and ground level outside of the lobby. Contact: Steve Sondheimer at ssondheimer@centeronhalsted.org using the subject line "Green Team". The Senior Services program seeks volunteers with various skills and expertise to create and facilitate workshops for the senior services patrons. You will work with the Senior Services staff to generate opportunities that might be attractive to the Center on Halsted senior community. Every 6 – 8 weeks, Center on Halsted hosts art gallery openings featuring the art of LGBTQ community artists. Occurring from 6 – 8 p.m., the gallery opening provides an opportunity for members to join in community and enjoy the diversity of artistic expression. Volunteers are needed to facilitate check-in, collect $5 admission donations, and set-up and clean-up for the event. Contact: Steve Sondheimer at ssondheimer@centeronhalsted.org using the subject line "Art Gallery Opening". PLEASE NOTE that volunteers interested in working with our youth program must have a cleared background check and attend a separate youth volunteer training. You can view and register for upcoming trainings here. If you are HIV+ and ready to make a difference in the life of a young person recently diagnosed with HIV, then this is the opportunity for you. Application and additional orientation required. Contact: Steve Sondheimer at ssondheimer@centeronhalsted.org using "U4U Mentor" in the subject line. Day/Time: Ongoing; Fridays 4:00–6:00 p.m. The opportunity is simple and the outcomes so worthwhile. Do you have knowledge and love of sports that might attract our youth program community? Are you delighted to spend time with diverse young people of varying ages, demographics and gender expressions? Are you compassionate with young people whose stories might include housing instability, family rejection, interaction with the legal system? Mostly are you comfortable showing dignity and respect to an often disrespected community? If so, we need and want you! Contact: Steve Sondheimer at ssondheimer@centeronhalsted.org using "Youth Recreation Programming" in the subject line. The opportunity is simple and the outcomes so worthwhile. Do you like to cook? Does it make you happy seeing people enjoy food you prepared for them? Are you delighted to spend time with diverse young people of varying ages, demographics and gender expressions? Are you compassionate with young people whose stories might include housing instability, family rejection, interaction with the legal system? Mostly are you comfortable showing dignity and respect to an often disrespected community? 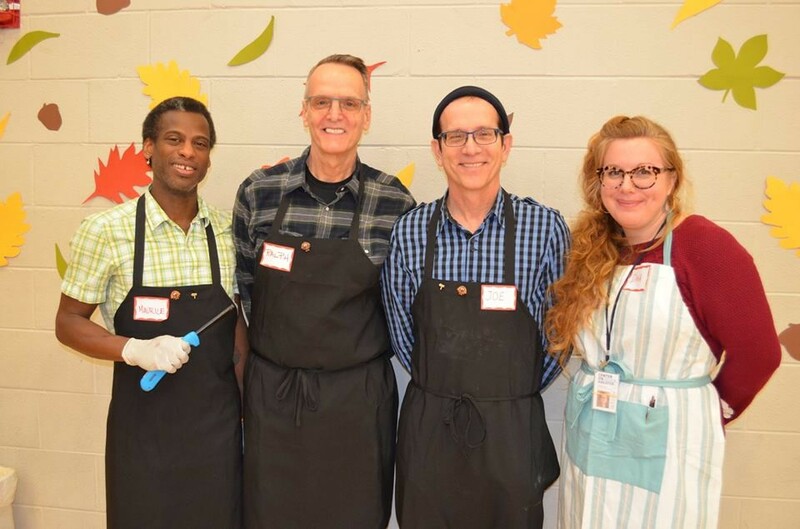 If so, we need and want you to be part of our kitchen team that nightly prepares, serves, and cleans up dinner for approximately 30 youth who attend our Youth Program each day. Contact: Steve Sondheimer at ssondheimer@centeronhalsted.org using subject line “Program Kitchen Aid”. Do you have a skill, talent, or interest that you would like to share with the youth in our program? The youth program is looking for volunteers to run weekly 1-hour workshops for groups of up to 8 youth. In a recent survey, the top five areas of interest for workshops expressed by our youth were: Yoga, Painting, Self-Care, Anger Management, and Creative Writing & Poetry. Other interests expressed by our youth were: Dance, Self Defense, Sexual Education, Etiquette, Weight Lifting, and Meditation. Note: If you would like to run a more low-key workshop, such as a weekly movie night, that is a need of ours too! Contact: Steve Sondheimer at ssondheimer@centeronhalsted.org using subject line “Workshop Facilitator”. Questions? Comments? Please contact Steve Sondheimer , Volunteer & Events Manager, at ssondheimer@centeronhalsted.org.